Most people do not like to pare it tastes bitter. However, there are many benefits pare one can be an antidote to the cancer cells. Research in Japan proven efficacy pare proven to stop cancer cells in the body. In that study, they used mice that were then injected cancer cells. After the mice were injected with extracts of bitter melon. They observed the development of cancer cells in these mice, and the results of cancer cells in mice stopped growing. Inside there is a substance called pare lesichin that serves to strengthen the immune system so as to prevent the growth of cancer cells. So pare themselves be consumed by healthy people to prevent the growth of cancer cells in the body. 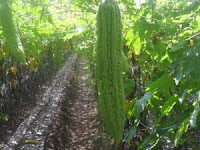 Aside from being an antidote to the cancer cells, the other benefits of bitter melon is to lower blood sugar levels due to insulin substance in the plant's Latin name Momordica charantia. These substances play a role in helping reform process glucose into energy. Pare also contains many useful vitamin C to strengthen the immune system to prevent wrinkles on the face, and protect against ultra violet rays. Additionally carotene compounds in these vegetables are also very good for maintaining eye health. In addition, based on the results of another study by one of the researchers in Japan, the benefits of bitter melon is also very good for menangakal pare many free radicals as it contains anti-oxidants. How now you're interested in taking pare?